Iridescent feathers in troodontids - possible? Image by Matt Martyniuk, all rights reserved. I've written a lot about the various ways feathers get their color in order to create some rough guidelines for paleoartists restoring feathered stem-birds. I recently had a quick discussion over at DeviantArt with one of the best currently-working paleoartists around, Emily Willoughby, over the plausibility of a blue Troodon. The illustration in question is here. Note that it has a few other anatomical issues that make it somewhat less than a fully accurate rendition, but is the coloration one of them? I wasn't sure, so I did a little extra digging to find out. As usual, this research is cursory and I welcome any additional input on research or details I may have overlooked. The Tale of the "Sail"
This version of the painting, "The Fin-Back Lizards" (background: Dimetrodon incisivus, foreground: Naosaurus claviger) by Charles R. Knight, appeared in H.F. Osborn's obituary for E.D. Cope, The Century Magazine (1897). Public domain. Prehistoric tetrapods are fascinating to young and old alike in large part due to their often unusual features. We have duck-billed hadrosaurids, mammoths with huge curving tusks, horned and frilled ceratopsids, plate-backed stegosaurids, and, famously, a variety of prehistoric animals with sails on their backs, like the dimetrodonts. Sails are often said to be present in other prehistoric animals, like ouranosaurs, spinosaurs, and arizonasaurs, but these are not the quintessential "sails" present in early synapsids like edaphosaurs and dimetrodonts. In the former, the neural spines of the vertebrae are very tall, but also broad and flat, as in normal vertebral columns. These probably anchored muscles, and at the very least supported a ridge of thick soft tissue, not just skin. In dimetrodonts and edaphosaurs*, on the other hand, the neural spines are not just tall, but thin, round, and strut-like. These aren't the kind of vertebrae that would be wrapped in muscle, and may have supported only a thin membrane of skin (I'm not aware of any actual direct evidence for a skin membrane sail, but correct me if I'm wrong). During the late 1800s, the anatomy and relationships of the sail-backed synapsids was not yet well understood. In a situation weirdly parallel to the famous story about Brontosaurus, the first skeletons of what are now known as Edaphosaurus were found lacking skulls. A small herbivorous skull was actually found first, and given the name Edaphosaurus, but the connection to the sail-backed body was not made until later. The whole saga of Naosaurus, as the headless body was named, was told by Brian Switek at Laelaps. In short, the headless body of Edaphosaurus was seen by E.D. Cope as being very similar to Dimetrodon, and Cope referred a skull to it which is know known to belong to the smooth-spined form rather than the knobby-spined form. When it was discovered that is was actually the small, herbivorous heads already named Edaphosaurus belonged to the headless body, the name Naosaurus was sunk. 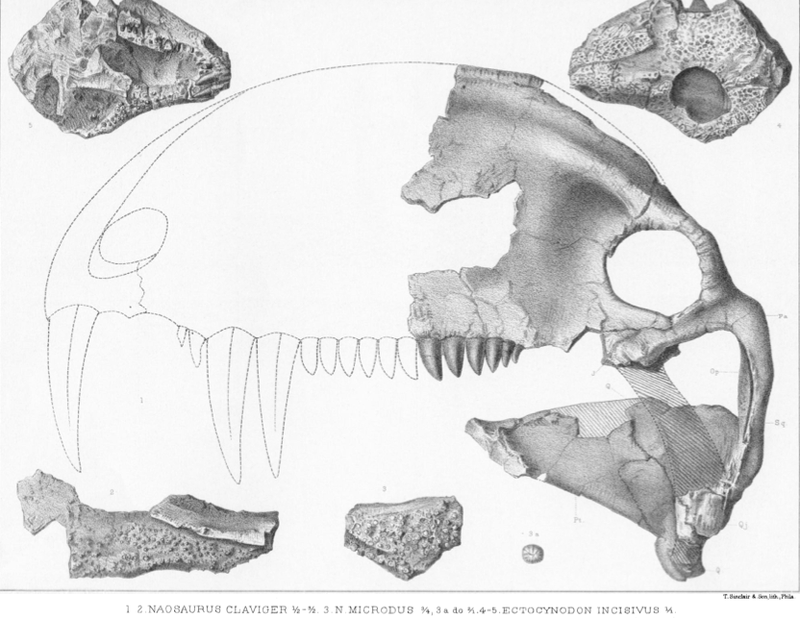 Skull attributed to Naosaurus claviger (but now to Dimetrodon) from Cope 1888, public domain. The thing that interested me most about revisiting this story was the whole history of the term "sail" itself. Why were these synapsids referred to as "sail-backs", a term that has since spread to any prehistoric animal with long neural spines? Many people are aware of the early speculation that sail-backed synapsids used their sails to, well, sail. That is, to literally use their tall dorsal fins to catch the wind and move across water. Most people nowadays also think back on this idea as rather silly. The dorsal fin "sails" were, of course, parallel to the body, like the configuration of a sloop. However, unlike the speculative use of large crests as sails in some pterosaurs, which could at least move the head and neck to change the orientation of the supposed sail, poor dimetrodonts and edaphosaurs would be consigned to getting dragged more or less laterally across the surface of the water. At best, the undulating swimming motion of the torso would cell catch some wind, but the resulting constant change and undulating motion of the sail itself seems like it would make steering very difficult. (Nonetheless, I'm certain I've seen an artistic rendition of this behavior somewhere). Switek says in his blog post the same thing I and everyone else tend to assume about Cope's sailing hypothesis, which is that Cope suspected "the long spines had a membrane stretched between them and could be used to catch the wind, just like a sail". But, that's not quite right. It's true that Naosaurus translates as "ship lizard", named for Cope's sail-back hypothesis. 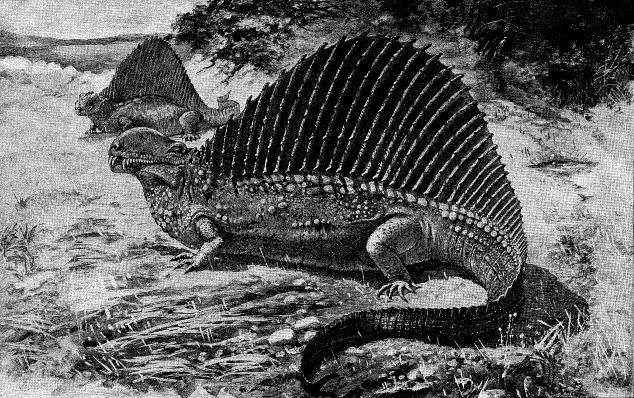 But this hypothesis seems to have been specific to Cope's ship lizard, not to the (he thought) closely related Dimetrodon. In fact, if you read some of Cope's original descriptions, you find that the only feature he thought separated Naosaurus from Dimetrodon was the presence of transverse processes on the neural spines. Those are the little thorny side-projections present on the sides of the edaphosaur sail, contrary to the smooth, spike-like bony projections that make up that of dimetrodonts. "In a full-sized individual, the longest cross-arms, which are the lowest in position, have an expanse of two hundred and sixty millimeters, or ten and a quarter inches, while the spine has about the height of five hundred millimeters (19.75 inches), the body being 60 mm. long. The animal must have presented an extraordinary appearance. Perhaps the yard-arms were connected by membrane with the neural spine or mast, thus serving the animal as a sail, with which he navigated the waters of the Permian lakes." (Cope 1888, p. 294). *Interestingly, most phylogenetic analyses nowadays suggest that these two types of sail-backed synapsids do not form a natural group with each other. So either the sails evolved convergently, or they are a trait of the common ancestor of the two types of animal. Which would mean our own ancestors were sail-backs! **Knight later revised his Naosaurus painting, removing the transverse processes altogether and giving it an actual Dimetrodon skull, modifying it into simply a restoration of a Dimetrodon. * Cope, E. D. (1888). Systematic Catalogue of the Species of Vertebrata Found in the Beds of the Permian Epoch in North America with Notes and Descriptions. Transactions of the American Philosophical Society, 16(2), 285-297. * Osborn, H. F. (1897). A Great Naturalist. Century Magazine, November. It's often said by those who support a strict phylogenetics-based system of naming life that it's only by restricting well-known names from neontology (the study of modern organisms) to crown groups can we avoid making unjustified assumptions about members of stem-groups. These kinds of unjustified assumptions have been rampant in the history of studying stem-birds. Archaeopteryx has traditionally been depicted, incorrectly, with a reversed hallux, and occasionally even with beak-like structures, simply because it's a "bird", and those are features all birds have. Except Archaeopteryx is not a true "bird", it's a stem-bird, more closely related to birds than to any other living animal group, but not a member of the group that includes all modern birds. It's fair to assume that an extinct member of the duck lineage, like Vegavis, had a bill, but that's not necessarily so for, say, Patagopteryx, despite the fact that it is usually referred to as a "bird". the top surfaces, and pebbly, polygonal reticulae on the bottom surfaces. Most paleoartists have absorbed these kinds of warnings, and do a good job of avoiding obvious errors based on typology, the assumption that all species in a certain "type" share "key characteristics." But there are some typological memes in the bird lineage that are more pernicious, possibly because their actual evolution is something most artists don't think about very much. Take, for example, the bird-like scutes that are almost universally illustrated covering the tarsus (upper foot/lower hind limb) of dinosaurs. Is there any evidence that these were actually present in any given group of non-theropod stem birds? Well... no. Not that I'm aware of (if you know differently, please comment!). Sinosauropteryx prima with tarsal scutes. Image by Matt Martyniuk, licensed. I'm not sure when this meme began, and if it's related to the Dinosaur Renaissance when the link between birds and dinosaurs was re-established. 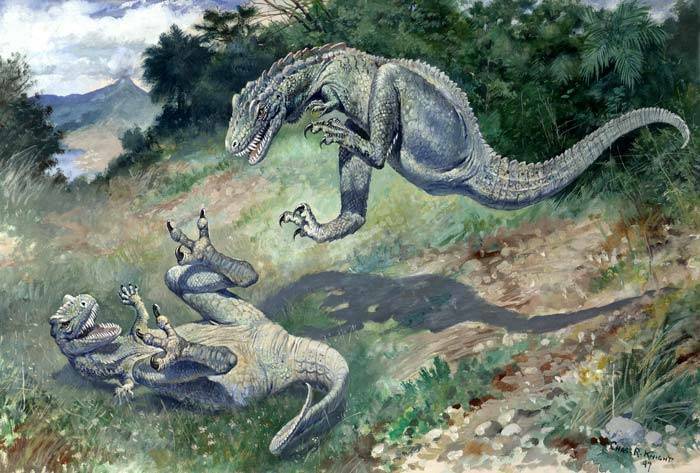 Looking at some Charles Knight paintings, such as his famous "Leaping Lealaps", it appears that the feet of his theropods were scaled based on modern lizards (more on the differences between lizard scales and other types of "scales" below). Bakker's influential early restoration of Deinonychus does not include any obvious scutes on the feet or tarsus. Mark Hallet, on the other hand, did include what look like oblong bird-like scutes on his theropods. 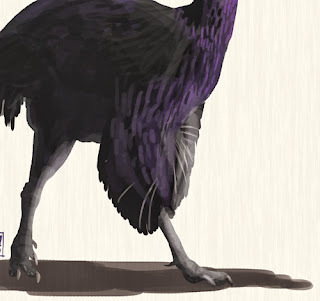 At any rate, it's hard to deny that "bird feet" are typical of almost all modern reconstructions of dinosaurs, including my own, and are not limited to theropods. 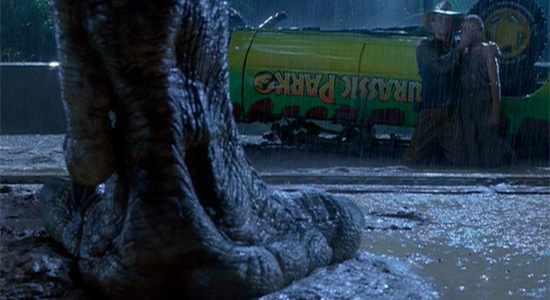 Bird-feet are often restored on ornithischians and even pterosaurs. Of course, like many paleo-memes that developed during the 1980s, the main idea seems to be using this as a flourish to make otherwise scaly dinosaurs seem more bird-like. And thanks to skin impressions, we know that many dinosaurs had scales, right?